31 w w w . M o d e r n T i r e D e a l e r . c o m Tell us about your family. I'm married to my husband Bobby, who I am also lucky enough to work with every day. We have three wild and wonderful little boys, Tucker, 11, Taylor, 8, and Tripp, 3. What habit do you wish you could break? Over-thinking. If you could have dinner with anyone, living or dead, who would it be? Eric Steward. Most people won't know who he is, but he's one of the most influential people in my life. Eric passed away July 2, 2018, aer a 10-month battle with cancer at only 39. Eric and I have a child together and were previously married. He was always my best friend and my first phone call no matter the situation. Eric battled many rare medical issues and never let his sickness define him or hold him back. I want to always live with the passion that Eric did every day. If we gave you $1,000 and one hour, how would you spend the money? I've always wanted to pay someone's grocery bill, so I would go pay for groceries until the money is gone. What do you expect to be doing 20 years from now? I hope to be training my boys to take over as the third generation of our business. 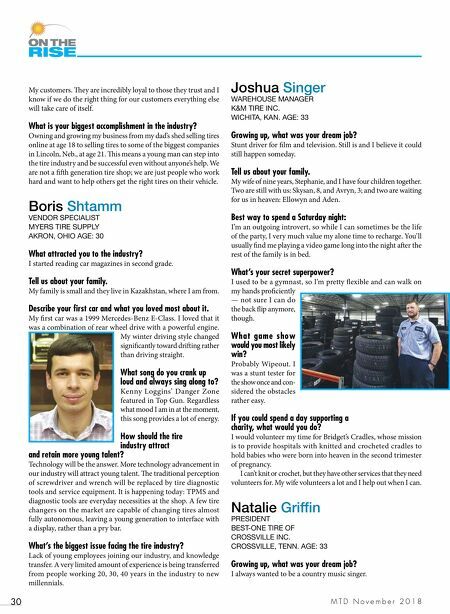 Michael Shivers PRODUCTION SYSTEMS MANAGER COOPER TIRE & RUBBER CO. FINDLAY, OHIO AGE: 29 What's the biggest challenge you've faced in your career? One of the biggest challenges I have faced in my career is my transition from project leader to manager. I want to be involved in the details and help drive projects. My most recent role has forced me to delegate and coach projects to success. How should the tire industry attract and retain more young talent? e tire industry needs to demonstrate what it can offer. is is a highly complex field with highly complex problems that need solved. ese problems range across engineer- ing disciplines, business units, marketing, and supply chain and will not truly be solved until we work across these disciplines to solve problems. ere's a niche job for everyone. What's the best way to spend a Saturday night? Staying in with friends playing one of my new board games. Tell us about your family. My wife and two daughters, ages 3 and 1, are all about Disney right now. What's the biggest issue facing the tire industry? e biggest issue facing the tire industry is sustainability. Natural rubber is single "specie" sourced and we use predominately petro- leum products. e first tire company that can make an affordable green tire will have a product that is desired from the market. What keeps you up at night? Wondering if the Detroit Lions will ever break through to become the elite football team they are. Go Lions! 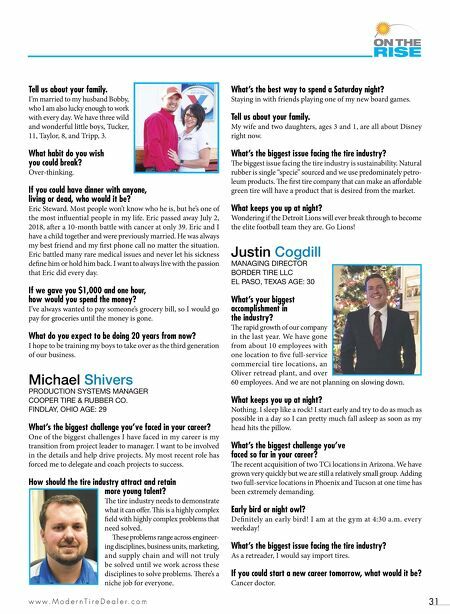 Justin Cogdill MANAGING DIRECTOR BORDER TIRE LLC EL PASO, TEXAS AGE: 30 What's your biggest accomplishment in the industry? e rapid growth of our company in the last year. We have gone from about 10 employees with one location to five full-service commercial tire locations, an Oliver retread plant, and over 60 employees. And we are not planning on slowing down. What keeps you up at night? Nothing. I sleep like a rock! I start early and try to do as much as possible in a day so I can pretty much fall asleep as soon as my head hits the pillow. What's the biggest challenge you've faced so far in your career? e recent acquisition of two TCi locations in Arizona. We have grown very quickly but we are still a relatively small group. Adding two full-service locations in Phoenix and Tucson at one time has been extremely demanding. Early bird or night owl? Definitely an early bird! I am at the gym at 4:30 a.m. every weekday! What's the biggest issue facing the tire industry? As a retreader, I would say import tires. If you could start a new career tomorrow, what would it be? Cancer doctor.